save the file and exit. This should fix the issue. You can then launch eclipse from unity dashboard. Install Gimp : sudo apt-get install gimp . It is an image editing software like photoshop. Gradle ships with it's own groovy library so no need to explicitly install groovy. Note : I am going to keep updating this List as an when I find something useful. If you want to add something to this list do post it in comments. I have faced this issue for quite some time now. 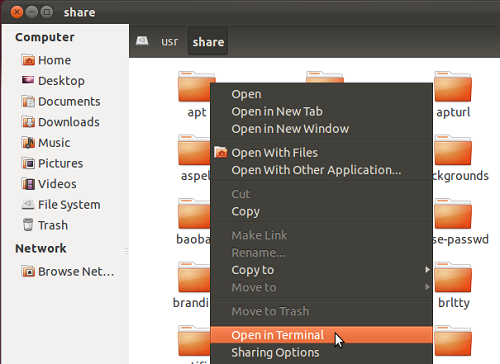 I always install a new version of Ubuntu and the "Open in Terminal" option from right click menu is gone. I am not sure what changes but it used to be default in 10.10 (Maverick) as far as I remember and I hate to just open the terminal and navigate to the desired directory using cd command. 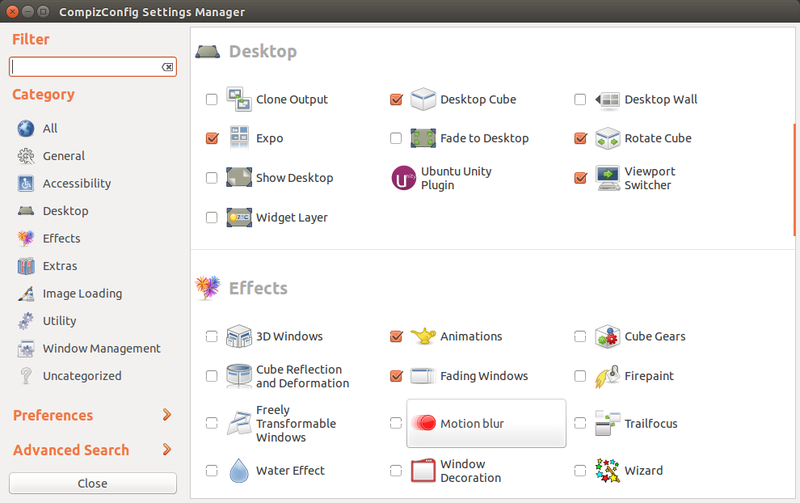 Anyway no matter what user interface you use (Like gnome or unity which is default now a days) it uses nautilus as it's default file manager and nautilus has this plugin in it. So let's see how can we install this plugin. 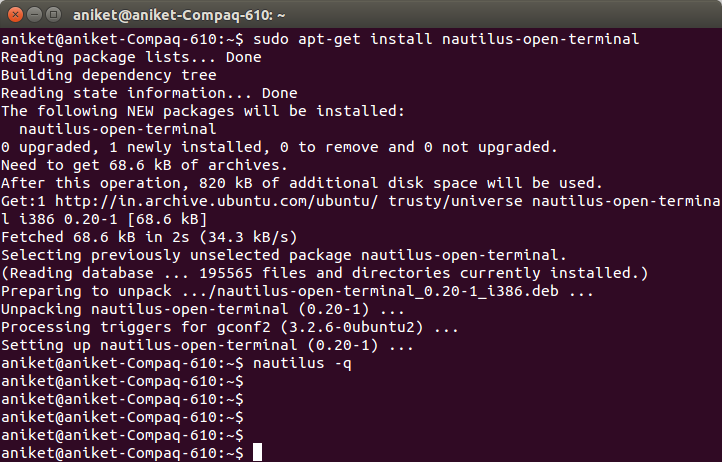 BTW the plugin is called nautilus-open-terminal. Next time you open your file manager you can use this feature. HtmlUnit is a "GUI-Less browser for Java programs". It models HTML documents and provides an API that allows you to invoke pages, fill out forms, click links, etc... just like you do in your "normal" browser. So in this post I am going to host a simple HTML page on a server and use HtmlUnit to get that page and perform click action on the button on that fetched page. In a directory create two file index.html and server.js and put in the following contents in it. Go ahead click on the button. You should be able to see "Hello World" alert. Our server is now ready. We are basically trying to automate this click by using HtmlUnit. As usual I am going to use Ivy as my dependency manager and Eclipse as my IDE. You are free to choose yours. I am using 2.15 version (latest) of HtmlUnit [ Link To Maven Repo ]. Lets create a class called WebpageButtonClicker.java and add our code in it. that's it. Now run the Java code. You should see the following output. Alert was : Hello world! Note : See how we have registered a Alert handler in above code. It is a callback that is received on any alert that is triggered. Similarly you can have handlers registered for multiple events like prompt and refresh. 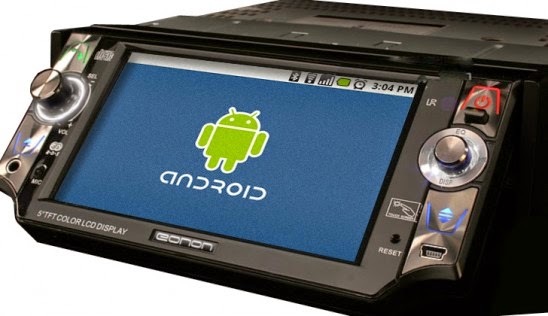 In this post I will show how can we make an Android application. The aim would be very simple - Create an App (.apk file). Install it on my Moto E running Kitkat , run the app. The App will have a button which on click will show "Hello World" text for some time [Also called toast]. Open your Eclipse. Go to File -> New -> Android Application Project. Fill in project details. I am naming it "HelloWorld". Also as stated earlier I am going to target Kitkat as target OS. Minimum can be set to Froyo. Leave the options in the next screen to default.Click Next. If you want your own icon for the App go ahead provide one. For this project I am going to keep everything default.So click on next. Select to create a black Activity. We will edit this activity so suit our requirements. Select Next. Give the name you wish to your Activity. I am giving it "HelloWorldMainActivity". You will automatically get a corresponding name for the activity layout. Click on Finish to finish creating your project. First lets modify the layout to suit our requirements. Most of the method should already be generated by Eclipse for you. Some changes that I have done is make the Activity class implement android.view.View.OnClickListener and have overridden the onClick() method. "Resources can be your icons/images that your Application uses, the localized Strings, layouts etc. Android resource compiler compresses and packs the resources and then generates a class named R that contains references or identifiers that you can use your code to reference the resources. " So you can reference your resources Strings, layouts, icons using R class. Also if you notice in onCreate() method I am getting a reference of the button we had created in our layout xml and assigning a onClickListener to it. What it means is when user presses this button it should invoke a callback method onClick() of the OnClickListener instance the button is registered with. In our case it is the Activity itself as it is implementing OnClickListener and we have registered button for OnClickListener using this keyword. Content is quite self explanatory. We define String resources in this file. It has a name and a value. We can reference the String resource using R.string.StringName. Eg. R.string.hello_world. We can also create a custom Toast by providing a custom Layout to it. Eg. That's it for the code part of it. Let's see the demonstration. 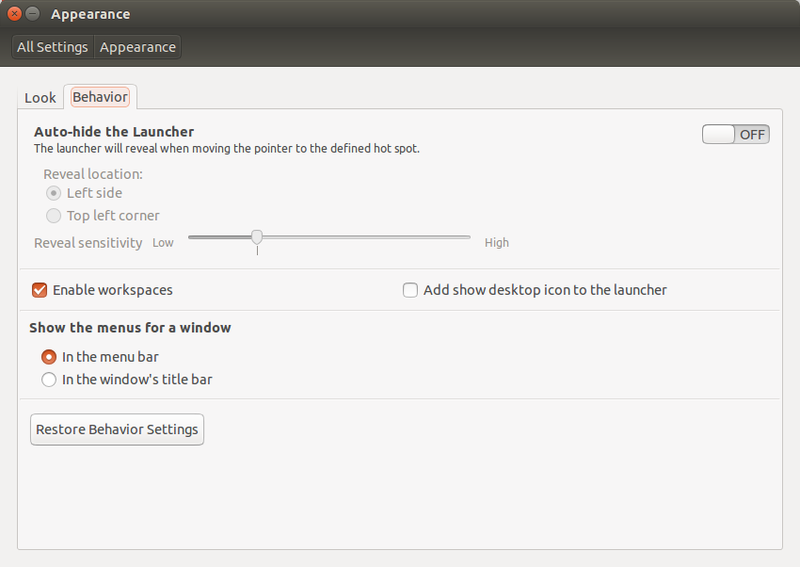 Right click the project in Eclipse -> Select Run as -> Android Application. You should see following screen. Choose your device. If you don't have one you can create virtual device. I have my own device so I am going to use that. If you have problems recognizing your devices go through the following posts I have written before. Troubleshooting steps when Android device is detected but not recognized by Eclipse ADT. After you select Ok then the app should get installed in your device and open the app on it's own. Go ahead click on the button and you should see "Hello World!" toast message on the screen. That's it for creating an Android hello World Application! An Activity in Android represents an User Interface that is rendered on a Single screen. It is what an user sees on Android devices and user interacts. Activity as an entity in Android has it's own set of APIs and life cycle. We will see that in this post. Each Activity that you write will ultimately extend the class android.app.Activity. Note : Prefer using the onRestoreInstanceState() method than onCreate() for restoring the instance state. Also the onSaveInstanceState() method is not called back button is pressed. If your application doesn't need to update resources during a specific configuration change and you have a performance limitation that requires you to avoid the activity restart, then you can declare that your activity handles the configuration change itself, which prevents the system from restarting your activity. Note: Handling the configuration change yourself can make it much more difficult to use alternative resources, because the system does not automatically apply them for you. This technique should be considered a last resort when you must avoid restarts due to a configuration change and is not recommended for most applications. To be of use with Context.startActivity(), all activity classes must have a corresponding <activity> declaration in their package's AndroidManifest.xml. Activities in the system are managed as an activity stack. When a new activity is started, it is placed on the top of the stack and becomes the running activity -- the previous activity always remains below it in the stack, and will not come to the foreground again until the new activity exits. We can call finish() in an Activity to terminate it and return all the resources to OS. When you rotate your Screen on Android device Activity is actually destroyed and recreated. However you can change this behavior by handling such configuration changes in your activity. Some time back I had create a demo Tic-Tac-Toe Android Application covering most of the basic concepts and if you are new you can give it a glance. Should be pretty easy to understand. I have put it up on the git. Clone it on you local machine, import it in your Eclipse and go through it. Note : Most of the above information is taken up from the documentation pages and combined to add all info about Activities that I find useful from programming point of view. Documentation pages liks are provided in Related links section below. and the list will continue...... . 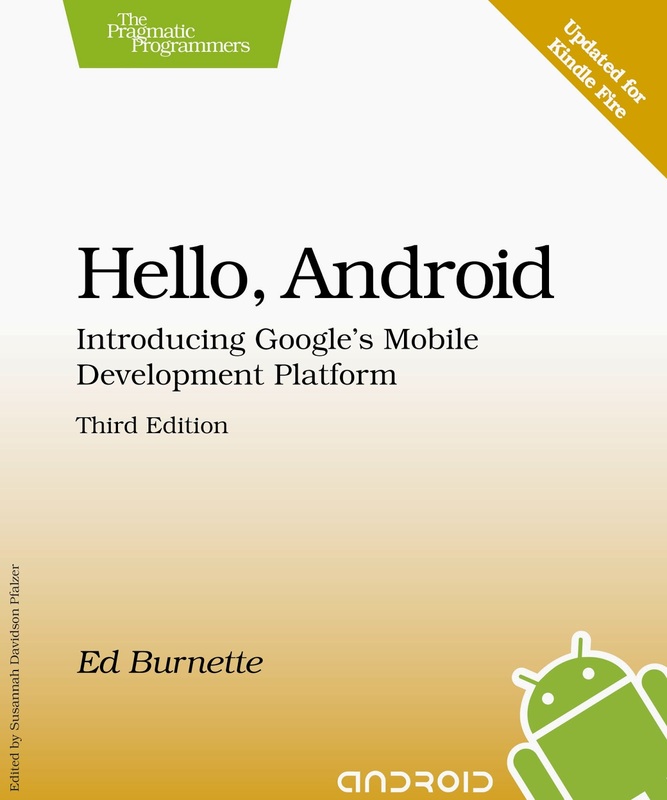 Lets start knowing more about Android. Other aspects like Activities, it's life cycle, virtual machine that manages the processes are different. We will get to those. If you are familiar with Java then you must be aware of Java runtime (JRE) and also the JVM (Java virtual machine that runs the actual java processes). .java files are converted to .class files by java compiler . class files are essentially byte code that java interpreter in JVM understands. 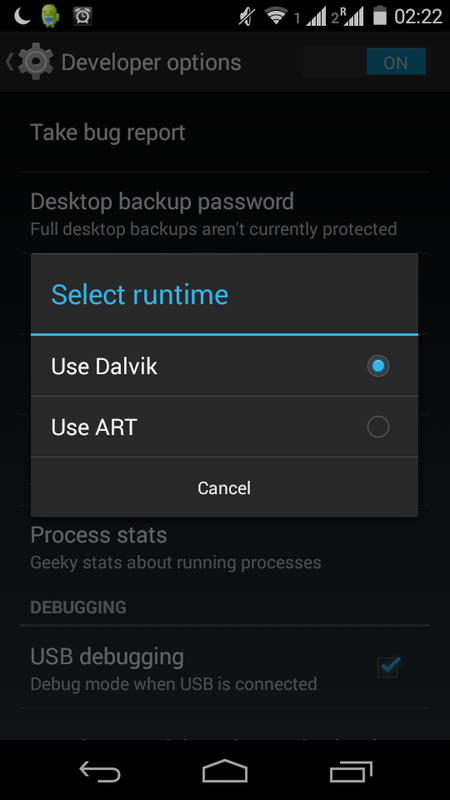 Android uses Dalvik virtual machine to to manage Android processes. Dalvik is Google's implementation of JVM that is optimized for handheld devices. .class files and jar files generated from .java files are further converted to .dex files as .dex files are more compact and efficient and form an important aspect memory limitations. 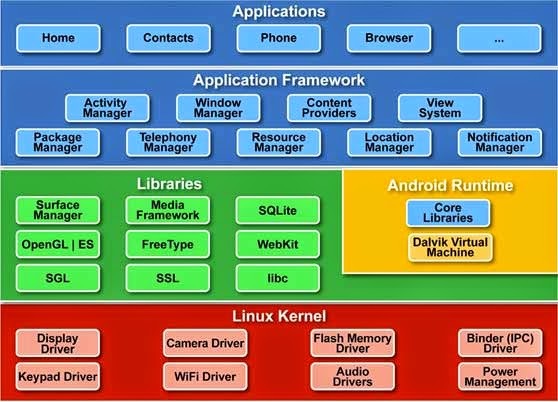 Android System architecture is as shown in above diagram. Top most layer is your Applications/Widgets. They talk to the underlying framework. 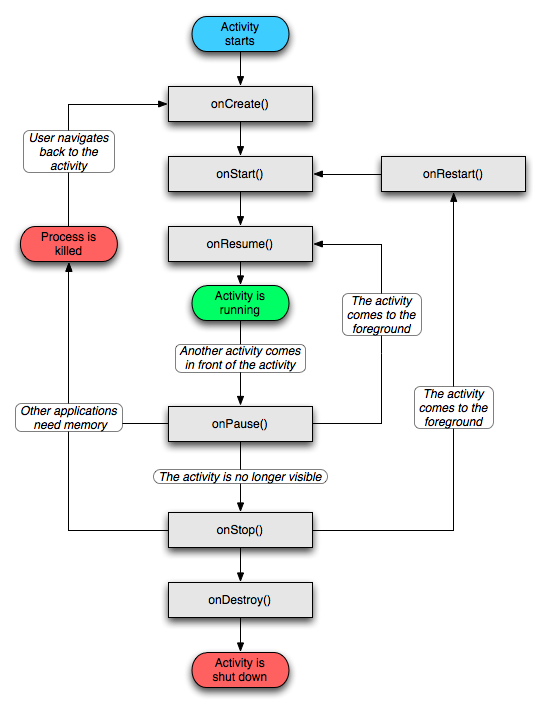 For example Activity Manager manages the activity lifecycle of all the activities that form a part of your Application.Each module in the framework will inturn use libraries which may be 3rd pary like OpenGL or own APIs (Android runtime libraries). 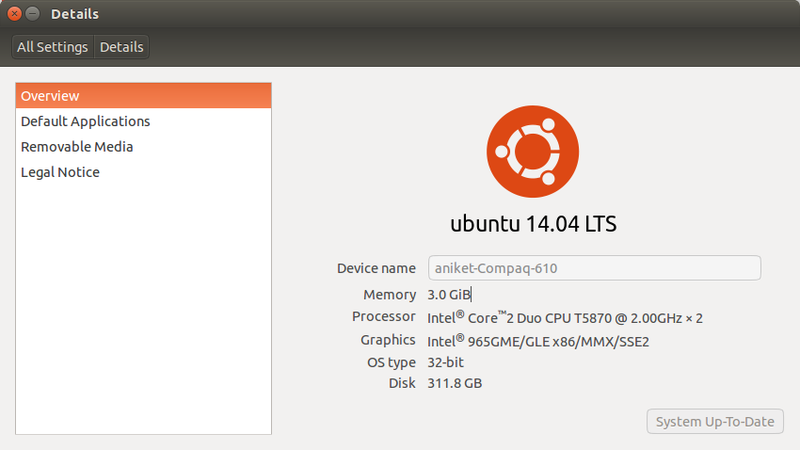 Finally at the bottom is the Linux kernel that takes care of processes, drivers etc. Linux Kernel : As any other Linux kernel this provides memory management, process management, security, drivers, File & Network I/O. In addition to this there are some android specific features that are added to this kernel layer. These include power management services, managing low memory, IPC (Inter process communication) between processes. Application Framework : These layer mainly consists of frameworks that can be used by your android Application. These frameworks inturn will communicate with underlying native libraries to achieve what you desire. Think of it as kind of abstraction. You don't have to dive down to understand native code. Eg. package manager that takes care of installed apps, Activity manager that takes care of Activity lifecycle etc. Applications : These are applications that you as a developer write (mostly in Java). As stated earlier you can use various managers at framework level to harness android features. There are also some in built apps that come with the android phone like browser, native email, phone dialer etc. Just to give an overview I'll try to explain the use cases of above entities. If you have an Android smart phone the icons you see on your screen are nothing but intents. Intents are basically a mechanism for performing an action like stating an Activity or Make a call or share your picture. So when you click on the icon you basically trigger an intent that start your Application. Another exaple would be sharing your picture. When you click share you must have see a lot of options like Facebook, Gmail, Twitter etc. These are basically Applications that are listening to the intent specific to sharing some status. When you click on share it will fire an intent and will give you list of applications that are listening or registered for this intent. Activities are UIs that form you Application. Each application can have one or more activities. Each Activity can further have fragments (Don't worry about this if you are not aware - but it's the tabs you see on the screen like for dual SIM). Services are nothing but daemon processes that run in background. Music ? Does it get closed when you navigate or open some other application ? No... That's a service. Service will continue to run unless you explicitly terminate it. Content providers are basically way to share data between applications. Resources can be your icons/images that your Application uses, the localized Strings, layouts etc. Android resource compiler compresses and packs the resources and then generates a class named R that contains references or identifiers that you can use your code to reference the resources. Manifest file form a very important part of any Android Application project. 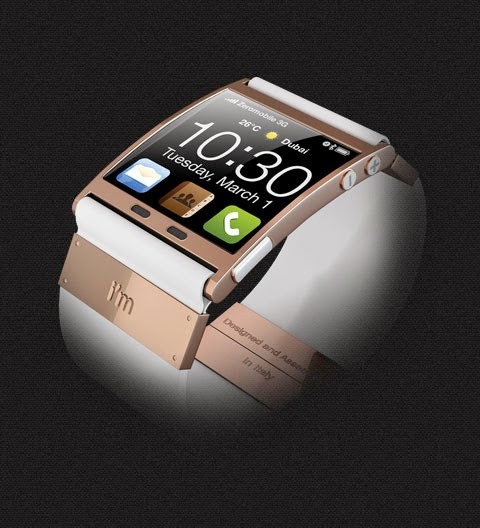 It provides Android OS information about the application. It must always be named as AndroidManifest.xml and should be available in projects root directory. It should contain permissions that application uses. These are shown to user for accepting when the application is installed. It also has the Minimum API level or Android version that your application supports. 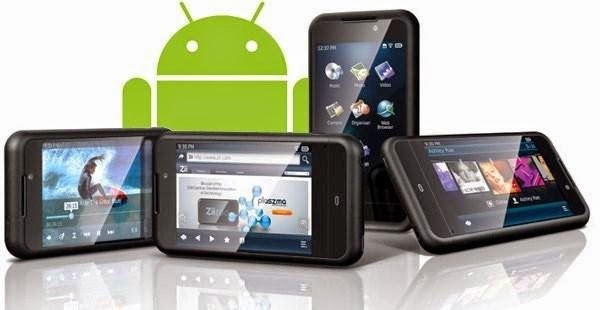 Google play will decide compatibility of application for your device on the basis of this.. It also has other components listed such as Activities in the application, intent filters that the app listens too etc. There are multiple code versioning tools. Some of them are SVN, Git, Mercurial, Perforce etc. In this post we will see how can we install git on windows and use it to create a local repository of a existing repository on github. Download the installer from the official git website. If you are a beginner leave every setting in the installation workflow to default except probably the screen that says add git to the classath (This would alter your $PATH env variable). Finally click on finish to complete the intallation. If you see above output you have successfully installed git on your System. To clone a repository you have to use git clone repoUrl command. Prior to pushing your changes you need to be aware of the changes that you have made. For that you can use git status command. git commit -m "git commit message"
to confirm your change. You will be asked to provide commit message. An empty commit message will abort the commit. This will reset all your commit. To push your changes you need to execute git push command. You can see your commit changes on github. Below is the screenshot for my demo changes in this post. Confused with master, remotes, origin? Here, master is a branch in the local repository. remotes/origin/master is a branch named master on the remote named origin. remotes/origin/HEAD is the default branch for the remote named origin. This lets you simply say origin instead of origin/master. So master is the branch name where as origin in the remote repo name. Undo the last Git commit?